Obvious to readers of this blog is the fact that we enjoy learning about the history of the places we visit. What may not be as evident is that we are sometimes even willing to pay a small fee to obtain that knowledge! 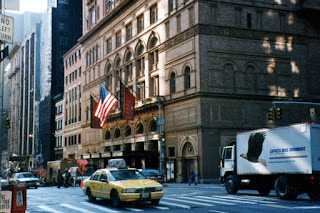 Such was the case on a recent trip to Manhattan, where our hotel’s midtown location inspired us to seek out a visit to Carnegie Hall. Currently celebrating 120 years of existence, the hall offers special guided tours at 12:30 on Wednesdays and Fridays or on Saturdays at 11:30. 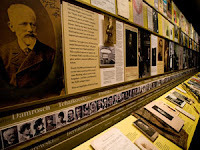 For a mere ten dollars visitors can see Isaac Stern Hall, named for the celebrated violinist who saved the hall from destruction, the Rose Museum, and discover the history of the revered venue along the way. 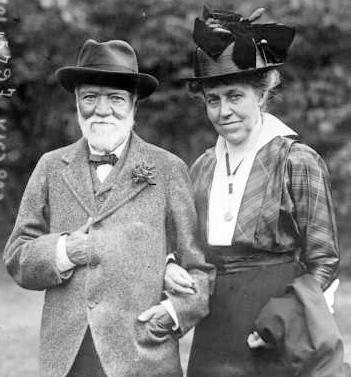 Our docent began by telling us that Andrew Carnegie—a Scottish-born steel and railroad magnate, philanthropist, and music lover—decided to invest one million dollars to construct a concert hall on West 57th Street to honor his wife, singer Louise Whitfield. 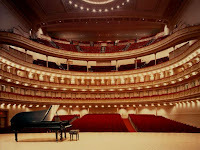 Through the Carnegies’ involvement with the Oratorio Society of New York, they knew William Burnett Tuthill, brownstone architect and amateur cellist whom Andrew Carnegie chose to plan the edifice. Tuthill, who had studied the sound quality of great European concert halls, was said to have a “golden ear.” Because of the simple design he created (without sharp angles, frescoes, or columns), the main hall has excellent acoustics and concerts are often recorded here. Andrew Carnegie’s good friend Thomas Edison had convinced him that electric lighting was the wave of the future; for this reason no chandeliers were affixed inside the building. Instead, coal-powered generators, installed in the basement, at first illuminated the rings of lights on the ceiling and around the balconies. From the upstairs Dress Circle, visitors can admire the original red and black colors, the emblems of angels and bagpipes (representing Louise and Andrew), and the gold leaf decorations of the interior. The so-called “Music Hall” was completed in 1891; Tchaikovsky was on hand on May 5th of that year for Opening Night. 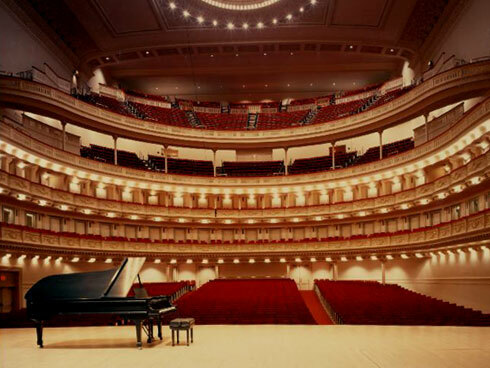 The guide pointed out that Carnegie Hall is not just for concerts. Although Liza Minelli has had the most consistently sold-out performances, over the years everything from circuses to lectures have taken place at this location. Icons of American and international culture from Amelia Earhart, Langston Hughes, and Sarah Bernhardt to J. K. Rowling have spoken or performed here. The hall was even the setting for the memorial service of television newscaster Peter Jennings. The Rose Museum, which opened in 1991, contains artifacts such as programs and records from past events, one of Benny Goodman’s clarinets, a sequined jacket from Judy Garland, and the silver trowel Louise Carnegie used to lay the cornerstone for the building. A movement to destroy Carnegie Hall began in the late 1950s but Isaac Stern headed up a group which eventually saved it. The building underwent substantial renovation in 1986 to add elevators and access for the disabled. It is well worth seeing.